If contamination is found on a property, a Phase 4 will be required, which is the decontamination process. The decontamination work includes the implementation of a rehabilitation plan based on the results of environmental characterization works and in accordance with the Soil Protection and Contaminated Sites Rehabilitation. Decontamination is then conducted to comply with the environmental criteria relevant to zoning and/or the use of the property. Our team will provide you with decontamination work that meets your needs while accounting for the limitations and features of the site. Soils can be excavated from the site (ex situ approach) and transported to an authorized site. They can also be handled onsite through in-situ processing techniques. As the name indicates, in situ treatments have the advantage of allowing the soil to be decontaminated onsite, without excavation. So they enable the decontamination of hard-to-reach sites. However, in situ methods do not apply to all contamination cases and their efficiency is dependent on several factors. Groundwater contamination is intimately linked to soil contamination; as it flows through the soil, it can contribute to the spread of contaminants. In the event of soil intervention, an upwelling of contaminated water can occur around the excavation which must be pumped and treated before it can be drained into the sewer system. In some cases, floating contaminants will have to be extracted and the source of contamination will have to be addressed to eliminate active contamination. A monitoring of groundwater quality may then be recommended. What are the main parameters influencing the choice of a decontamination method? Several parameters must be analysed to determine the most appropriate decontamination method. Duration and cost of treatment, efficiency and practicality, required equipment, site hindrances, becoming of contaminants (e.g. destructive or non-destructive method), resulting pollution (e.g. sound, vibrations, visual, atmospheric), organizational criteria, environmental efficiency (ecobalance), etc. type of soil microflora, available organic matter, type of substrates, secondary metabolites produced, presence of inhibitory compounds, etc. site attendance, treatment acceptance, etc. What is the method for managing excavated contaminated soils? 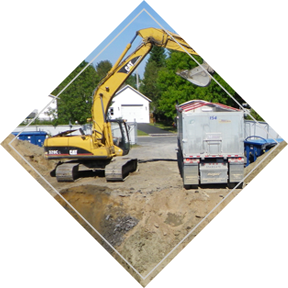 Once excavated, contaminated soils are carried out to a site authorized by the MDDELCC. The method for managing contaminated soils varies according to the level of contamination, i.e. the A, B and C levels of the SPRCSP. For example, soils with lesser than level A contamination can be used without restriction, while A-B soils can be used under some circumstances as backfill or covering material for a sanitary landfill (SL). Soils contaminated beyond level C can be managed in different ways depending on the concentration and nature of contaminants. Such soils may, among other things, be transported to an authorized treatment site or to a landfill. What are the benefits of in situ treatments? What are the disadvantages of in situ treatments? Bien qu’ayant a priori été développé pour traiter des eaux souterraines contaminées, les traitements in situ sont dans la grande majorité des cas utilisés lors d’une contamination des sols par des composés organiques volatils (COV) ainsi que par des produits pétroliers, et ce principalement lorsque le site contaminé est difficile d’accès.